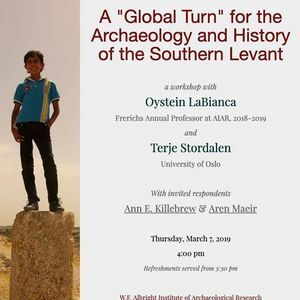 The workshop will make the case for a new approach to understanding and narrating the past of the Southern Levant that takes its inspiration from the nascent field of global history. The workshop will consist of two twenty minutes presentations followed by two invited responses and time for general discussion. Oystein LaBianca, professor of anthropology at Andrews University, Michigan, USA and senior director of the Hisban Cultural Heritage Project, will introduce the global history perspective and discuss how he is using it to interpret the archaeological record of Tall Hisban, biblical Heshbon, in Jordan. Terje Stordalen, professor of Hebrew Bible/Old Testament studies at the University of Oslo, Norway and OBEL Social Science visiting professor, University of Aalborg, Denmark, will discuss the implications of the global history perspective for understanding interactions between local (bottom-up) and trans-local (top-down) forces in shaping the particular cultural context within which a new type of authoritative discourse was crystallized in the Southern Levant, namely that which we associate with the professedly superb literature of the three Abrahamic religions. Oystein LaBianca (Ph.D Anthropology, Brandeis 1987) is an anthropological archaeologist whose career as a Professor of Anthropology at Andrews University in Michigan has been devoted to developing theoretical constructs, hypotheses, methods and procedures for studying the longue durée throughout historical times in Jordan and the Southern Levant. As senior director of the Hisban Cultural Heritage Project he has organized and completed over two dozen archaeological expeditions to Tall Hisban, biblical Heshbon. Professor LaBianca has been a visiting researcher at the Department of Archaeology, University of Cambridge (Spring 1990) and at the Department of Archaeology, History and Religion of the University of Bergen (most recently spring 2000). 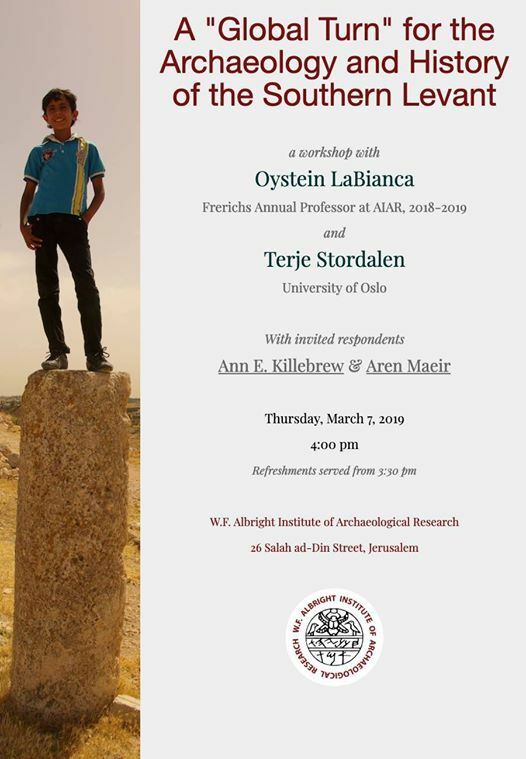 During the spring semester 2019 he is the Frerichs Annual Professor at the Albright Institute of Archaeology in Jerusalem. He is a long-time member of the boards of trustees of the American Schools of Oriental Research (ASOR) based in Alexandria, Maryland, USA and the American Center for Oriental Research (ACOR) in Amman, Jordan. Terje Stordalen (Dr. theol., Oslo, 1998) is a professor of Hebrew Bible / Old Testament studies at the University of Oslo and also Obel Visiting Social Science professor at Aalborg University, Denmark. In an earlier phase he served as professor at MF School of Theology (Oslo) and at the Lutheran Theological Seminary in Hong Kong. He has had a number of shorter visiting appointments, i.a. at Peking University, China, Georg-August Universität, Göttingen, and Lund University, Sweden. As head of the former research network Religion in Pluralist Societies (University of Oslo) Terje conducted and headed extensive cross-disciplinary research. He was also the leader of the research group Local Dynamics of Globalization in the Premodern Levant, situated at the Centre for Advanced Study, Norwegian Academy of Science and Letters in 2014–15. The material to be presented in the workshop relates to the work of this research unit. Terje has also taken part in excavations at Tall Hisban, Jordan.